Update: Quick has resigned his position. Update: The following statement was released by John Quick in response to some of today’s allegations. The statement does not, however, address the reports he misrepresented his education on his resume. Original: The Senate Finance Committee and Senate State Affairs Committees didn’t take public testimony during Tuesday’s confirmation hearing of Department of Administration Commissioner-appointee John Quick, and now that appears to be a mistake. A letter sent to the committees, a copy of which was provided to The Midnight Sun, accuses Quick of fabricating just about everything relating to his ownership and involvement with a coffee shop and frozen yogurt store in Puyallup, Wash. A separate inquiry into his education also casts doubt on his claims of having an MBA. His experience with both featured heavily in his testimony as he made the case to oversee the Department of Administration, which includes many varied government duties. Without taking public testimony, the committee advanced his nomination and it would take 31 votes of the combined Legislature to confirm him. “I am Janie Reynolds, 50% owner of Anthem Coffee & Tea and Elements Frozen Yogurt. My husband, Larry Reynolds, owns the other 50%. There has never been anyone else except my husband and me on the ownership structure,” the letter, which was addressed to senators on both committees and dated on Wednesday, says. According to a report by Alaska’s Energy Desk, Quick’s claims of his education are also suspect. According to the report, Wayland Baptist University in Texas has no record that he graduated and received the MBA degree he claimed on his resume (He claimed he attend for two years, but the report says he attended for just nine months). Wielechowski: When did you sell your ownership interest in Anthem Coffee and Tea and Elements Frozen Yogurt? And who were your co-investors in that business? Quick: Thank you Senator, good question. That was in 2000—I believe—14. The other party’s a private party and probably does not want to be spoken about it a public setting, but it’s a friend from high school. Again, that specific line of testimony was disputed in Reynolds’ letter to the committees. “I would like to make it known that Larry and Janie Reynolds have been the only owners of Anthem Coffee & Tea and Elements Frozen Yogurt. No one else has had any percentage of ownership. The ‘private party’ he speaks of is fictitious,” Janie Reynolds explained. The same went for his claims that he helped with investment. She took issue with Quick’s claim that he offered health plans as a small business owner, a move that seemed to impress the senators. “If John is referring to his time with Anthem Coffee & Tea, this is not correct. Health plans were not offered to our staff until 2018,” she wrote. According to the 2015 newspaper profile of the business and materials posted on Anthem’s website, the company has prided itself as a family-owned and family-run operation. In a video produced by Bryan Reynolds, the son of Janie and Larry, he asks the couple why they opened the coffee shop in the first place. “It was you,” Janie Reynolds says to her son. “Well, it was you and Alicia,” said a grinning Larry Reynolds, referring to Bryan’s wife. A search of records does show Quick was a co-owner of businesses—a co-working space in Tacoma and an online supplements company—that are both closed, unlike Anthem Coffee & Tea, which now boasts several locations, and Elements Frozen Yogurt. Mistakes in the vetting process for appointees isn’t new as we’ve seen with Gov. 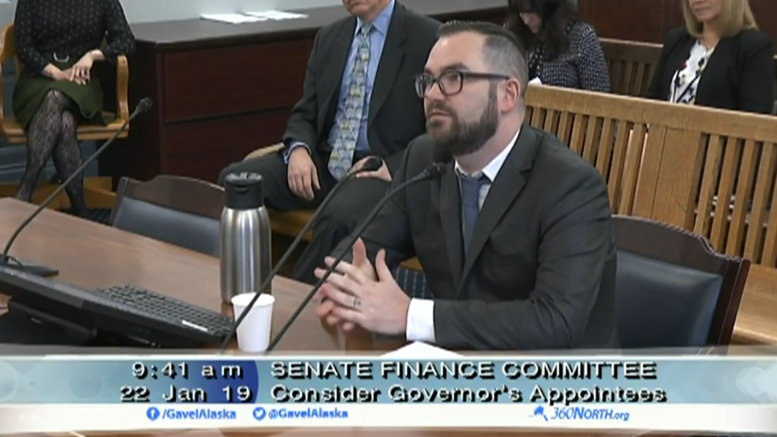 Bill Walker’s attempts to appoint Jeff Landfield to the Alaska Commission on Judicial Conduct and his selection of Tom Braund to the Alaska Senate. Both revealed blind spots in the vetting system, embarrassing both the administration and the appointees themselves in the process. Both cases, however, dealt with sometimes-hard-to-find social media posts (on opposite ends of the severity spectrum, we should add) and not outright falsehoods about employment and education. However, Quick has already been on the job for more than a month and the gaps in his resume are fundamental and easy-to-check. It was a simple call to the owners of the businesses he claimed to own, as well as a call to the registrar’s office that revealed several glaring falsehoods in Quick’s resume. Either alone should be enough to disqualify him from the position, and it should call into question the vetting process the Dunleavy administration is putting to use. The Dunleavy administration has yet to make a public comment about today’s revelations. Be the first to comment on "Dunleavy appointee John Quick’s credibility crumbles after simple reference check with old boss"